THE MAYBELLINE STORY : Maybelline Roars as the American Dream unfolds in the 1920's. Maybelline Roars as the American Dream unfolds in the 1920's. The family was thriving, too. 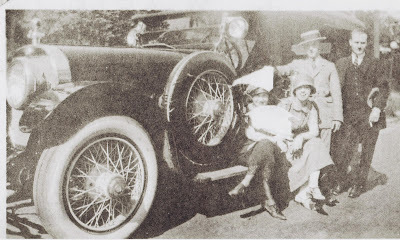 A period of prosperity and good times blanketed the entire Williams clan, but no one enjoyed it more than Tom Lyle's brother Noel - the driving force behind the Maybelline Company - Noel James Williams felt the glow of success as Vice President of Maybelline that year and Tom Lyle depended on his down to earth decision making older brother to help "skyrocket Maybelline to the moon," during the prosperous 1920's. There was one other reason Noel felt on top of the world that summer of 1925 - after two darling daughters, Helen and Annette, Frances had given him his boy! Baby Noel Allen Williams was a golden haired boy and the pride and joy of his successful father. He was to grow up like a Prince, never knowing the harsh reality America and the rest of the world would face five years later when the stock market crashed. But for now, America and Maybelline enjoyed it's "Hay Day," and it was a time for big dreams, big cars and big futures. Thank you for following my blog and tell your friends!